A major sleeper of the vintage and a great effort, the 2006 Mouton-Rothschild boasts abundant notes of crème de cassis, licorice, truffles, forest floor and cedarwood. The stunning aromatics are still somewhat primary, but the wine is full-bodied with sweet, abundant tannin. Built like a skyscraper with multiple dimensions, this super-concentrated, beautiful blend of 87% Cabernet Sauvignon and 13% Merlot should drink well for 30+ years. Tasted at Bordeaux Index's annual 10-Year On tasting in London. 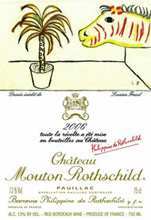 The 2006 Château Mouton-Rothschild has a brilliant bouquet that is extremely well defined: blackberry, minerals and graphite aromas that you could pluck from the ether. That sets you up nicely for what follows. The palate is very harmonious with supple tannin. The silver bead of acidity is beautifully judged and interwoven through this linear and classic Mouton that is reminiscent of those ethereal wines Baron Philippe oversaw during the 1950s. It is all about the precision and classicism without denuding the fruit intensity, to wit, a complete Mouton-Rothschild that is a strong candidate for wine of the vintage. This is the wine that really put winemaker Philippe Dhalluin on the map and rightly so. Tasted January 2016.